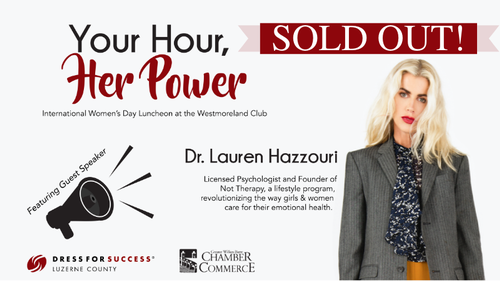 Please join us in collaboration with Dress for Success Luzerne County on International Women's Day 2019 for Your Hour, Her Power, a buffet-style luncheon featuring a Mentor Auction, guest speaker Dr. Lauren Hazzouri and an opportunity to connect with other incredible women in our region. Dr. Lauren Hazzouri, licensed psychologist, is the founder of Hazzouri Psychology and founder of NOT THERAPY. Dr. Lauren has been named one of the top five women in the world inspiring girls by German Glamour and her trailblazing work has appeared in Teen Vogue, Forbes, and British Vogue, among other publications. She has been a contributor to Gurls Talk and a frequent guest on Girlboss' Self Service podcast. Dr. Lauren is an active member of The American Psychological Association and has received multiple awards and honors for her work.